This extensively researched book, based on authentic folklore and legends from all over the world, is a perfect resource for the GM of any fantasy campaign. It includes more than 250 fantasy animals and plants, ranging from interesting nuisances to monstrous menaces. Each is covered in detail, with a physical description, likes and dislikes, attitude toward mankind, and means of attack. The main section is organized alphabetically, with creatures ranging from the voratious Afanc to the noxious undead rodents that men know as Zombie Gerbils. These rules and creatures are written for use with the GURPS Basic Set, Third Edition, but can be used with any fantasy system. Some of this material was previously published in the GURPS Bestiary but the majority is newer. All of the older beast descriptions have been reworked and brought up to Third Edition standards. Special chapters on Dragons and Fabulous Plants, with many examples of each. 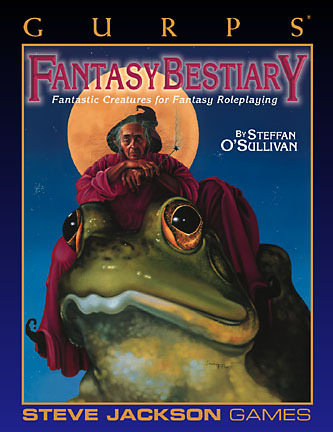 A chapter on Mythological Motifs that lets players customize any creature from this book or the GURPS Bestiary. These rules can enhance the creatures of any fantasy game you play, making this a truly generic book! The spells needed for many of the magical beasts and plants in this book. A detailed look at different types of animal and plant poisons. Two tables, each listing every creature in the book. One is arranged alphabetically, for easy reference. The other is organized by habitat, to let the GM quickly find an appropriate creature for any terrain or any situation. 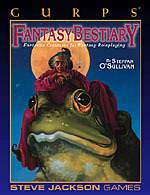 GURPS Bestiary – This new edition of the popular supplement includes many of the popular creatures from prior editions, as well as dozens of new beasts. GURPS Fantasy Folk – This book includes new, expanded versions of such fantasy "standards" as Elves, Dwarves, Orcs and Halflings, as well as exotic creatures such as savage Minotaurs, four-armed Insect Warriors and magical, mischievious Leprechauns.